Cirque opening soon in midtown. A new lounge & restaurant called Cirque will open early next year in place of the old Piebar on Monroe Drive in midtown. 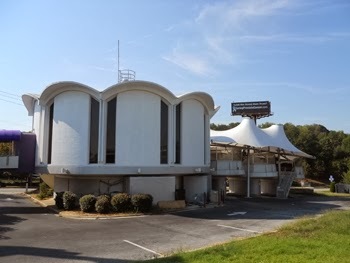 The unusual round building located at 2160 Monroe Drive just of I-85 was originally built in 1962 as a branch of Trust Company of Georgia. After sitting vacant for many years, it has played host to a number of failed restaurant, bar and lounge concepts. Most notably Piebar, from Atlanta's Concentrics Hospitality, called the unique building home from mid 2005 until late 2007. Eros Tapas Bar and IXTLAN Ultra Lounge are among the other concepts that have attempted to find success in the space in the years since Piebar's closure. Kechia Matadin, proprietor of The Daiquiri Factory on West Peachtree Street in midtown, is named as the owner behind Cirque. Records indicate Matadin applied for a liquor license in early March of this year and for a building permit in July. The building permit reflects a renovation cost of nearly a half million dollars. Bull Realty, who leases the property, states in a property flyer that there are 40 parking spaces and that the building is 4,200 square feet. For many of the earlier concepts, Piepar especially, parking was a problem, and it will be interesting to see how Cirque manages their limited parking. The building originally housed Trust Company of Georgia, not "Trust Company Bank of Georgia". Bank of Georgia was a separate institution. The other "big five" Atlanta banks of that long ago era were C&S (Citizens and Southern), Fulton National Bank, and First National bank. it will last 8 months. Parking is impossible, and there is no alternative. Cirque today, gone tomorrow. As we all know, this is one of Atlanta's most difficult locations, for any business. Besides the parking issues,getting on/off freeway, it's in a no man's land. Wishing the new proprietor, well. I agree, lack of parking and access is the problem. If the location was viable, Concentric would have tried another format after Piebar. I think it will be Cirque de So Long within one year of opening. Call me crazy but if they can fix the parking issue I think it will do well. Nightclubs are destination spots. People go there and stay there for hours. It's not like a bank or restaurant where the hassle to length of stay ratio is out of whack. This place will probably flop. If they were able to carve that place up into a few luxury lofts, I could see them selling--but I don't know if that's remotely profitable, probably isn't. Parking will kill it unless they can workout some arrangement with those old office buildings across the street to allow parking in their lots. If the spot is so bad, how in the world do they get financing for this venture? Do the lenders not know? Is the lender a gov. program? Lesbian lovers in the kitchen...oh the horror! i believe the "horror" has to do with the fact that the owner is disingenuous regarding an unqualified person manning the most important role in a restaurant. I'd love to see someone turn this into a private home and get rid of that awful stretched canopy over the former bank drive through windows. If I had the funds, I'd do it myself. Rather that than see it eventually torn down. One of the few cool mid-century commercial properties left in Atlanta. Confirmed with the extremely nice owner Kechia Matadin that they have secured overflow parking across the street and will be using a parking service to valet. Sounds like parking shouldn't be that big of an issue. Also with Gables Midtown right down the street I think this has some potential.